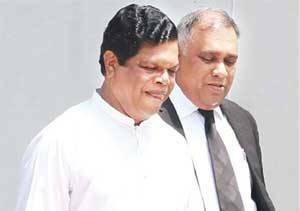 The Special Presidential Commission investigating the alleged bond scam yesterday said that the statement made by former UPFA Minister Bandula Gunawardena over a television channel that the Joint Opposition had made a written request to the Commission to testify before it was false and warned the Colombo District Parliamentarian to refrain from making such statements. The Chairman of the Commission Supreme Court Judge K.T. Chithrasiri said that he had made inquiries and found that nine persons had made written requests to testify before the Commission and there had been no request from the JO. He said irresponsible statements would give the wrong impression to the public about the Commission. Commission Chairman Chithrasiri said "Fifty per cent of the statements made by various persons to the media about the Commission are not true." Gunawardena expressed regret to the Commission about the statement he made and added that there was a memorandum signed by 26 members of the Joint Opposition prepared to be sent to the Commission, but he was under the impression that the document had already been dispatched.